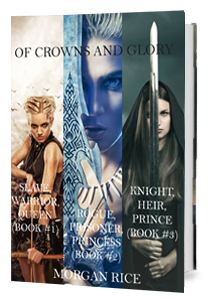 A bundle of books one, two and three in Morgan Rice’s new #1 Bestselling epic fantasy series OF CROWNS AND GLORY (SLAVE, WARRIOR, QUEEN, ROGUE, PRISONER, PRINCESS and KNIGHT, HEIR, PRINCE). Here are three bestselling novels, all in one convenient file. In SLAVE, WARRIOR, QUEEN, 17 year old Ceres, a beautiful, poor girl in the Empire city of Delos, lives the harsh and unforgiving life of a commoner. By day she delivers her father’s forged weapons to the palace training grounds, and by night she secretly trains with them, yearning to be a warrior in a land where girls are forbidden to fight. With her pending sale to slavehood, she is desperate. 18 year old Prince Thanos despises everything his royal family stands for. He abhors their harsh treatment of the masses, especially the brutal competition—The Killings—that lies at the heart of the city. He yearns to break free from the restraints of his upbringing, yet he, a fine warrior, sees no way out. In ROGUE, PRISONER, PRINCESS, 17 year old Ceres, finds herself forced, by royal decree, to fight in the Stade, the brutal arena where warriors from all corners of the world come to kill each other. Pitted against ferocious opponents, her chances of survival are slim. Her only chance lies in drawing on her innermost powers, and making the transition, once and for all, from slave to warrior. 18 year old Prince Thanos wakes on the isle of Haylon to discover he has been stabbed in the back by his own people, left for dead on the blood-soaked beach. Captured by the rebels, he must crawl his way back to life, find who tried to assassinate him, and seek his revenge. Ceres and Thanos, a world apart, have not lost their love for each other; yet the Empire court teems with lies, betrayal and duplicity, and as jealous royals weave intricate lies, they each, in a tragic misunderstanding, are led to believe the other is dead. The choices they make will determine each other’s fate. In KNIGHT, HEIR, PRINCE, 17 year old Ceres, a beautiful, poor girl from the Empire city of Delos, finds herself alone at sea, drifting towards the mythic Isle Beyond the Mist—and towards the mother she never met. She is ready to complete her training, to finally understand her power, and to become the warrior she was meant to be. But will her mother be there to greet her? Will she teach her all she needs to know? And will she reveal all of the secret of Ceres’ identity? In Delos, Thanos, thinking Ceres is dead, finds himself wedded to Stephania, and immersed deeper in a court he cannot escape from and in a family he hates. He also finds himself in the midst of the erupting Revolution, which culminates in a daring attack on the Stade.He is stuck in a game of pawns and kings, of traitors and queens, and it may be Ceres, after all, who is destined to change it all.